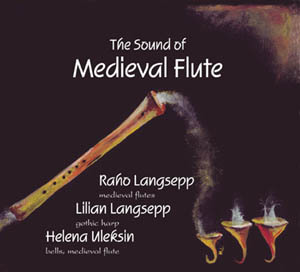 CD "The Sound of Medieval Flute"
The selection of the title "The Sound of Medieval Flute" is not fortuitous and aims to intrigue those listeners who know that no medieval transverse flute finds have been reported so far. What kind of transverse flutes were played in medieval Europe and what they sounded like can only be intuited by piecing together a kaleidoscope of information preserved in the graphic arts, in literary and poetic works touching on the performance practice of medieval instrumental music , in folk music traditions using similar instruments andthere is no hiding that anyway!adding a certain measure of personal imagination to the mix. No doubt the medieval transverse flute was similar in its construction to the oldest flutes, reports of which have been recorded in Asia, a part of the world where the instrument enjoys continued popular use to these days. The Consort's choice of the instruments including in addition to the flutes also a harp and a bell chime serves to highlight the nuanced and refined sound of the musical material performed. We support the view according to which, unlike in Renaissance music, the emphasis of the medieval period was not placed on varying the sound of the pieces played by using a multiplicity of instruments representing different musical timbres but rather aimed to achieve a maximum of nuance and expression on one single instrument. The bell chime (Af´) consists of bells made by the Swedish family firm "Morells Metallgjuteri AB", established in 1920. In founding and hand working their bells the firm employs traditional methods descended from their forefathers. 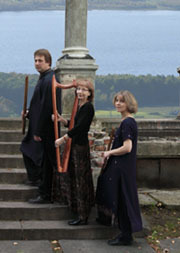 The world of medieval harps was amazingly rich in varying sizes, shapes and numbers of strings. The harp used to record this album is a copy (made in 2000 by the German master harp maker Eric Wilhelm Kleinmann) of the instrument that was purchased in mid-XIX century for the Wartburg Art Collection and in all likelihood used to belong to the famous Minnesinger Oswald von Wolkenstein (13771445). The CD is based chiefly on two Italian manuscripts: the London, BL. Add. 29987 and Codex Rossi. Dating from 1400, London, BL. Add. 29987 is one of the central sources of medieval monodic instrumental music available today. Through this manuscript a number of long and extremely interesting estampies have been preserved for us, shedding some light on the structure, sonic texturing and ornamentation of the 14th century instrumental music. We know today that Arabic music exerted a considerable influence on the development of European music. Indeed, an Oriental flavour can surely be felt in the estampies in question, yet they remain unmistakably European. Estampies have typically four to five verses, which are repeated twice: with an 'open' and a 'closed' ending. The next verse often incorporates a substantial portion of the previous one, so the verses gradually grow in length. The first verse usually introduces the main mood of the piece, the second verse takes the piece into a high register and the third into a low register. As a rule, the final verses have varying time signatures, often also changing the mode. All estampies in this manuscript are replete with chromatisms and run rather long. In recording this CD, we have worked with a facsimile edition of the manuscript. Occasional variations in note length and pitch result from personal preference and improvisation. Codex Rossi (compiled in Venice c. 1340) is one of the earliest sources for the Italian Ars Nova style. The pieces it contains are vocal, as in numerous other 14th and 15th century manuscripts. Still, some researchers claim that the music in these manuscripts may also have been performed instrumentally. In terms of musical genres, Codex Rossi contains madrigals, caccias and ballatas.